I sure do remember Gar when he was flying that souped-up T-34 in this photo (I think it had a 285 horsepower Continental swapped-in for the stock 225 horsepower Continental) as the lead plane for the tankers. I think it was the summer of 1967 when I was a ramp rat for Rogue Valley Skyways, refueling those tankers, as well as Gar’s T-34. I was in my first year of college at SOC and was trying to work several different jobs to make ends meet, since I’d bought a T-Craft with my college student loan money (why not, huh? 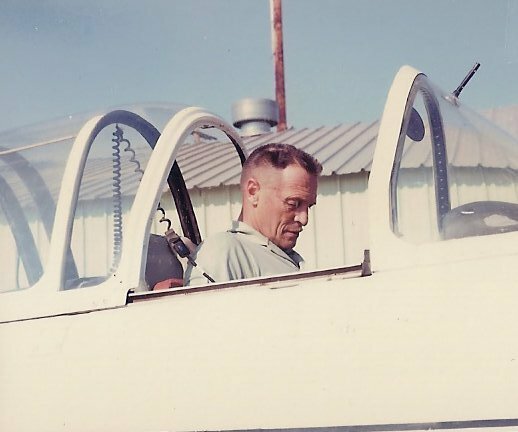 ), and I always looked up to Gar as my inspiration to keep at the game of flying, as he, to me, appeared to be the epitome of a swashbuckling, larger-than-life pilot’s pilot — he even LOOKED the part, of course, with his trademark-thin pilot’s mustache, hearkening back to the Golden Age of Aviation. I shall never forget one particularly exciting day at MFR during a particularly big fire in-progress, when I was really BUSY and hurriedly refueling the planes fighting the fire, and I was up on the high wing of an A-26 Invader, which was slicker-than-the-proverbial, well — ice — and I fell to the ramp (with the fuel hose going full blast before I could let go of the nozzle!) flat on back onto the tarmac, and I was absolutely AMAZED I wasn’t hurt at all! I remember Gar saw it happen, and he came over to ask if I were alright, and he gave me a big grin when I got up and nodded my head . . . then, he got back in his T-34 and took off again, into the fray. That particular day felt like a war was in progress, and — of course — in many ways, IT WAS!